You may remember when I last reviewed a Boylan's product, Boylan's Grape Soda. Now whether or not you remember that, or just read it, you know I was disappointed by it. This could have been because I hyped it up so much in my head that it couldn't live up to my expectations, or because it was just average... I really don't know which. 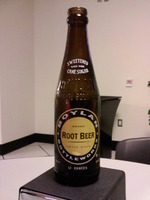 Either way I'vedecided to give the Boylan's brand another try with Boylan's Root Beer. I won't really go into the bottle art like I normally do, it has the same classic style as always. As with previous Boylan's brands they have a solid list of ingredients, and that is worth mentioning again. Carbonated Water, Cane Sugar, Natural and Artificial Flavors, Caramel Color, Natural Yucca Extract, Citric Acid, and our old friend Sodium Benzoate which preserves the flavor. That stellar list of ingredients seems like it would go well into a root beer.Ok... with the first sip I can tell you it’s a good root beer, there’s no denying that.It’s not that clean of an after taste though.Honestly I think its’ a bit too creamy to have a clean aftertaste, but that’s ok.To use root beer that most people drink in comparison, this tastes like a Barqs/A&W mix.It has a bit of a bite, but the aftertaste is more A&W.Now I’m not saying that this beverage is of the same quality of the mainstream brands, far from it, I’m just giving you something to compare them too.If offered this root beer along side the mainstream brands, I would take this one every time.Boylan’s root beer has one odd aspect about it.When you place the bottle to your lips, as soon as you start to drink... for a flash of time it has the essence of a regular beer.Some of that burn that some beers have exists in the product, if not for just a brief moment.Now take that for what it’s worth as I rarely drink beer... I could just be crazy.Mike has tried Boylan’s root beer as well, but says it tastes a lot like birch beer.The root beer/birch beer argument is one that we’ve shelved in the “Can’t Talk About” warehouse, along side soccer ties, Indiana Jones: The Temple of Doom, and pizza toppings.